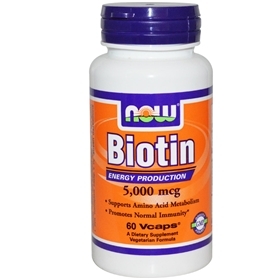 If you suffer from a biotin deficiency, you might experience hair loss or even brittle hair. Despite the fact that your body only needs a small amount, you still need it! If you’re diet isn’t providing it to you, you need to change your diet to include the foods that do. Biotin in your diet equals long and healthy hair growth just like you’ve always wanted. Biotin can turn brittle, flaky nails into healthy, beautiful nails. Suggested Use: As a dietary supplement, take 1 Vcaps® 1 to 2 times daily, preferably with meals.